Polaris is centered in a six-degree-wide field of view that shows a variety of other "polar stars." 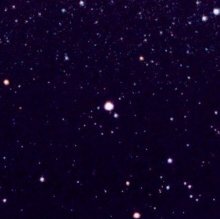 Lamdba Ursae Minoris is the reddish star up and to the right of Polaris, while Yildun (Delta UMi) is the brighter of the two stars at the upper right corner. (The fainter one is 24 UMi.) Roughly between Lambda and Polaris lies the North Celestial Pole, around which they all seem to revolve. Alpha, after which follow Kochab (Beta) and Pherkad (Gamma). The next three are all about the same, so while Yildun is technically number 6 in brightness, (slightly beat out by Epsilon and Zeta), its designation as Delta is certainly forgivable. Eta and Theta follow. The first distinction is the name. While most stars carry Arabic names, and the ones that do not are mostly of Greek or Latin extraction, "Yildun" is taken from a Turkish word for "star." Why such a faint star was given such a singular proper name is not known. But it may have to do with the second distinction. As the second star in from the Little Dipper's handle, Yildun is very close to the North Celestial Pole, the sky's point of zero rotation. Only 3.5 degrees away from the Pole, if not for Polaris, Yildun would make a reasonably acceptable Pole star and probably would have been called Polaris! Aside from Polaris itself, it is the closest star to the Pole with a proper name. It is circumpolar -- perpetually visible -- from the entire northern hemisphere down to a latitude of only 3 degrees north. Moreover, it is about as close to the Pole as it can be, as precession, the 26,000-year wobble of the Earth's axis, is now carrying the Pole away from it. Physically, Yildun is a quite-ordinary white class A star (A1) 183 light years away with a temperature of 9000 Kelvin, a luminosity 47 times that of the Sun, and a diameter of 2.8 solar. Its only real, and not all that unusual, physical distinction is a high rotation speed of 174 kilometers per second that makes its spectrum lines fuzzy. The star spins 87 times faster than the Sun, and makes a full rotation in just 19 hours.